California Gov. 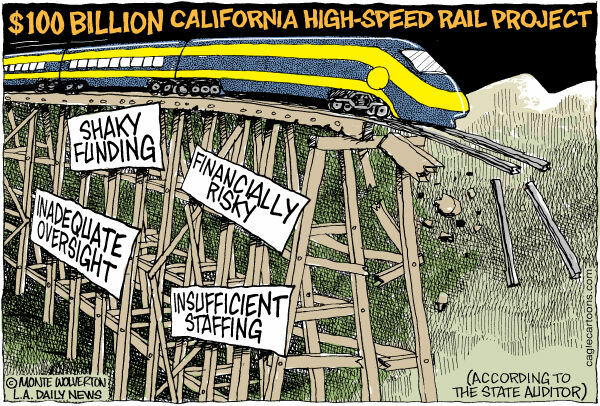 Gavin Newsom has canceled his state’s infamous “high-speed rail” project, saying it would cost too much (ya think?) and take too long (https://www.breitbart.com/politics/2019/02/12/california-governor-gavin-newsom-cancels-high-speed-rail-would-cost-too-much-and-take-too-long/). In 2008 this pipe dream was born, and nursed by then-governor Jerry Brown, as the answer to California’s perceived overuse of the car. The original estimated cost of creating a “bullet train” linking San Francisco and Los Angeles: $37 billion. By now they’ve already spent $5 billion, with nothing to show for it, the estimated cost has swollen to $77 billion–maybe as high as $100 billion, some say–and could not be finished earlier than 2033. California also ran into a problem when a lot of the people in really expensive neighborhoods, who initially voted for the project, discovered the train would run through their own vicinity. So they changed their minds about it in a hurry, and opposed it. This phenomenon has its own acronym, NIMBY–“Not In My Back Yard.” Somehow their own cherished Green New Deal project totally lost its appeal for them. The $5 billion is spent and gone. It cannot and will not be recovered. Big Government–it trashes everything it touches. This entry was posted on Wednesday, February 13th, 2019 at 3:25 pm	and tagged with another green flop, California's high-speed rail boondoggle, government gone wild, government waste, Green New Deal, Newsom cancels bullet train project, rail project goes belly-up, the high cost of green and posted in news. You can follow any responses to this entry through the RSS 2.0 feed. This is so sad and I do hope our lawmakers will take notice of it. Maybe when they stop guffawing. Hey! Nobody said the high-speed rail had to be any *good! Isn’t this just typical? The “not in my backyard” people do it every time. This mess shouldn’t have been in anyone’s back yard. Five billion bucks lost… forever. I think many people assume that if someone has gotten him/herself to the highest levels of government, they must be geniuses. “That’s ridiculous” Cortez just popped that balloon, really fast! I would’ve though Hank Johnson and Maxine Waters and John Kerry would have needed very little help in that department.